Belgium’s National Holiday – every day's a holiday! Belgium’s National Holiday on July 21st isn’t celebrated with quite the pomp and circumstance as other July National Days, such as Bastille Day or American Independence, but the celebration is growing. The country’s still essentially split in two, with the Flemish community in the northern part and the French community in the South. In fact each group has its own holiday–the Flemish celebrate their holiday on July 11th, the French on September 27th. Belgium was once the southern province of the United Kingdom of the Netherlands. The French-Catholic community wasn’t too happy with the Dutch Protestant government up in Holland, particularly with the king, William I. Also, the French region was undergoing difficult economic times, while the civil service and parliamentary system favored the Dutch. On August 25, 1830, a riot broke out in Brussels after (I’m not making this up) a particularly rousing performance of the opera La Muette de Portici. Yes, and they say today’s movies & music incite violence. Well, at least they don’t lead to full scale revolution. 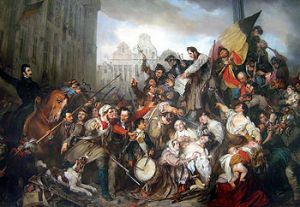 Few could have anticipated the riot would have created an independent Belgium, but the king failed to quell the rebellion, or to reach any sort of agreement with the people. The United Kingdom of the Netherlands was dissolved in December at the London Conference, in February the Belgians drew up a new constitution, and in June they chose Prince Leopold of Saxe-Coburg to be their new king. Belgium’s National Holiday marks the anniversary of Leopold I taking the oath in 1831 to become the country’s first monarch, the moment seen as the true inception of Belgium’s independence.